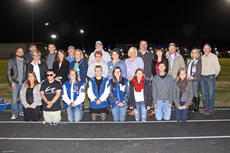 The LaRue County High School girls and boys soccer teams took the field in tournament action last week. After beating the Marion County Lady Knights in the opening round of the 18th district tournament last Wednesday, the Lady Hawks soccer team went on to play in the district championship against the Taylor County Lady Cardinals last Thursday. 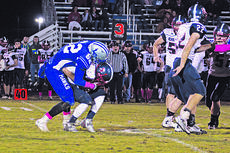 The LaRue County Hawks football team lost to the Edmonson County Wildcats 28-21 last Friday night. The loss put the Hawks at 2-6 on the season and 0-3 in district play. After the Wildcats scored first in the game last Friday, the Hawks answered in the first quarter with a 40 yard touchdown run by running back Cameron Pelligrino. The extra point was good to tie the game at 7-7. However, the Wildcats would put up an unanswered 14 points to make the score 21-7 at the end of the first quarter. 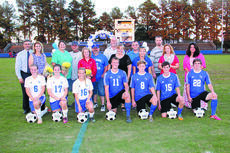 The LCHS soccer team is now 7-9-1 on the season, Their next match is away on Wednesday, October 14 when they take on Marion County at 6 p.m. during the first round of the 18th district tournament. Goals: Gillian Nunn 1. Saves: Whitney Bauer 9. The LaRue County Lady Hawks volleyball team is 17-12-1 on the season. Their next match is away against Caverna on Monday, October 19 at 6:30 p.m. during the opening round of the 18th district tournament. The second day of the Leachman Auto/KHSAA Boys’ State Championship didn’t go quite the way LaRue County junior Cameron Dawson wanted Wednesday. But a rough day at the state tournament is better than the alternative. Dawson shot a higher round in the final day of the state tournament than the first, but he still managed to finish in the top 20. 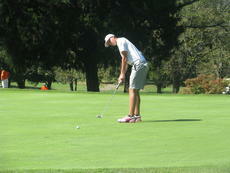 After shooting a 73 on the first day, Dawson fired a 2-over 74 to end up in a four-way tie for 19th.